By now, you should have received the emails on our behind the scene’s tour of Michael Garman and the national scenic byway, Frontier Pathways, we drove on Friday. It has been a busy week. On Thursday, we went to the Weisbrod Aircraft Museum at the Pueblo Airport. 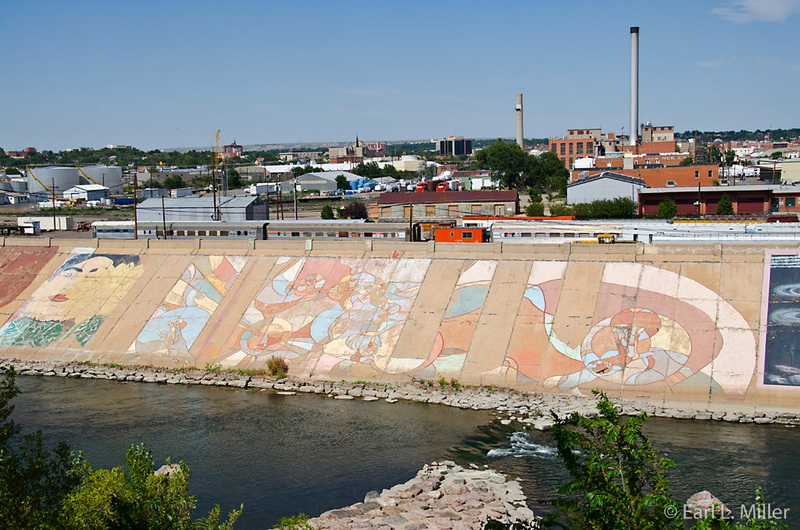 Saturday, we visited the Nature and Raptor Center, took a boat ride on Pueblo’s Riverwalk, and photographed the town’s mural located on their levee. On Thursday, August 2, we visited this museum which memorializes the B24, though none of this type of plane is on the property. You’ll find 29 other planes housed mostly in two hangars, with some outdoors. The first hangar is devoted to World War II while the second dedicates itself to Korea and Vietnam. We were fortunate to have as our docent and guide, George Williams, a World War II veteran who flew more than 20 missions, including three during the Battle of the Bulge. Most of his service was on B24s where he served usually as a gunner, but sometimes as an assistant engineer or pilot. He walked us throughout the entire museum relating information about the different planes and pointing out the other military displays. We saw a military jeep and a half truck, broadcast equipment used during the war, photographs of Dachau Concentration Camp, and information on Japanese balloonists and German troops. We also saw military uniforms and photos of aircraft, a diagram on how the Red Cross was involved with German prisoners of war camps, and a map of such German camps. One interesting exhibit was the diorama of the army/air force World War II base which was built in ninety days in 1942 at the airport. It was turned over to Pueblo in 1945. It housed up to 8,000 military and 750 civilians. Very little of the base exists. The Blitz hangar has survived. But the terminal and base chapel have moved from their former sites. Now called the Queen Ann Chapel, it’s located currently six miles from its previous home. 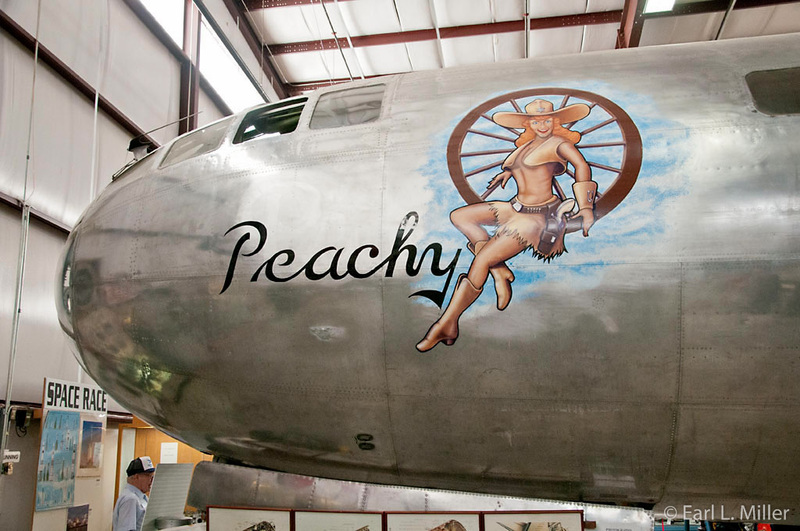 The museum’s highlight is a Boeing B-29A Superfortress with a 150-foot wing span. They have several trainers in the World War II hangar as well as helicopters, including two used in Korean and Vietnam. We eyed a Douglas B-26C Invader that did level bombing, ground strafing, and rocket attacks. It was in action from World War II through early Vietnam. Another was a Grumman F9F Cougar used by the Navy in 1951. It was the type used by the Blue Angels. One dating to World War I is a Beriot XI. It was like a Wright Brothers plane but could make turns. It was used by the balloon squadron. In hangar two, we saw a Sikorsky S1N1 Sebat helicopter used to take astronauts out of the water when they landed from outer space. We also saw four planes manufactured by North American including an RA-5C Vigilante, a T-28 Trojan Trainer, and an F-86D Sabre Dog. The Vigilante was used for reconnaissance. The Trojan was designed for carrier landings at 100 mph. It was fast enough to go in then take off again if it missed the cables. The Sabre Dog has been used by the Colorado Air Guard. We also saw a Bell UH-1M Huey Gunship used in Vietnam. The Cessna T-37B was the first trainer used by the Air Force and Navy. The Chance Vought F8 Crusader had wings made of titanium and could perform above 95% of the earth’s atmosphere. Their Lockheed 104A Starfighter broke records of speed and altitude. It performed a speed record of 1,404 miles per hour on May 16, 1958. It had seven climbs to height records. On July7, 1958, it achieved an altitude record of 91,241 feet. One plane outside the hangars was a navy plane - a Lockheed P2V-5 Neptune. A model of the same kind was recently used in Colorado’s fires. Its purpose is to dump slurry. When it was with the Navy, it could run for 15 hours since it carried extra fuel. Museum hours are Monday-Saturday 10-4 p.m. and Sundays 1-4 p.m. Admission is $7. If you buy a Passport for $10 from the Chamber of Commerce or Visitor Center, you get a two for one admission. The Passport also gives discounts on other attractions. Founded in 1981, the raptor facility at the Nature and Raptor Center of Pueblo is a wildlife rehabilitation center specializing in birds of prey. Each year more than 200 birds, orphaned or injured from Southwestern Colorado, are treated. About half of them are released after receiving the proper medical care. A few, currently 20, remain at the center because of permanent disabilities. Those that stay are involved in educational programs. If they have several of the same breeds, the center will find a home for a bird in another educator’s program. Those on view include barred, screech, and great horned owls; golden and bald eagles; turkey vultures; red tailed and Swainson hawks; American kestrels; a Peregrine falcon; and Mississippi Kites. Normally they have a lot of baby birds, but due to lack of food and low water, there aren’t as many birds around this year. They have 80 to 90 usually in rehab but because of the same conditions, they currently have 30 birds. At 1:00 on Saturdays, you can watch a free educational talk on birds. 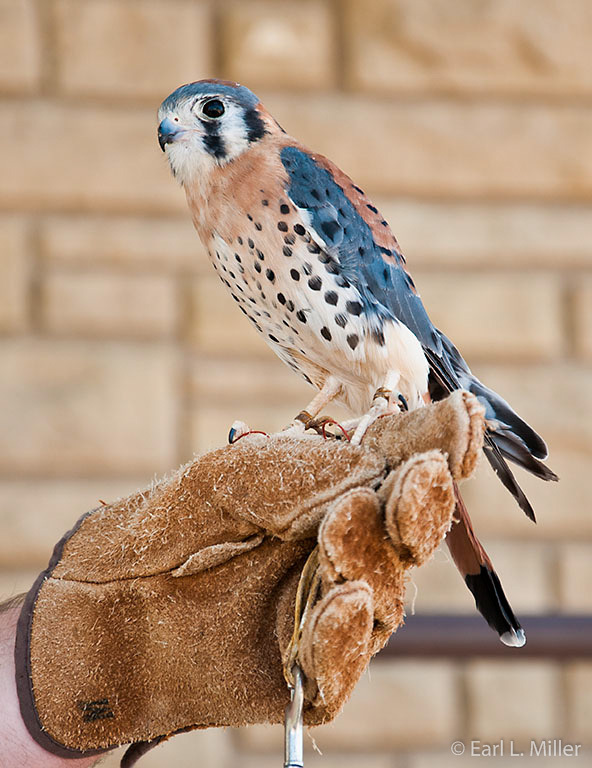 Our docent, John, presented Luke, a juvenile American Kestrel. You can tell juveniles because they have spots while mature birds don’t. Males differ in coloration from females. Males have grey blue on their heads and wings while females are completely brown. Luke had no physical injury, but was instead treated as a pet, so he became imprinted. He would not know how to react in the wilds, so is a permanent resident at the center. When he arrived, he didn’t mind being touched and would sit on shoulders, but it took awhile for him to get used to a crowd. Most injuries come from being hit by a car or they run into a window or fence. If the birds break a wing, they can recover after the fracture heals when they reacquire their muscle strength. If it’s an eye injury or they shatter a wing, they can’t be released and many are put down. Kestrels are slightly smaller than a Blue Jay. They eat mice and insects, but their favorite meal is a small bird. They are built for speed, 50 mph, and have extremely sharp eyesight, four times sharper than humans. They’re built for aerial combat and can hit and grab a bird before it lands on the ground. They eat the entire bird. They’re abundant in North America nesting in trees and cavities. At the end of the presentation, their staff released a female Kestrel who had been rehabilitated. It had been attacked by a cat that broke her wing and ripped all her tail feathers. It took time for the feathers to grow back. At the raptor center, they also have reptile talks at the center further down the road on the Arkansas River. Since snakes aren’t Earl’s thing, I took another look at the raptors on display, and we took off. Raptor facility hours are 11a.m - 4 p.m., Tuesday through Sunday. If you’re into hiking or biking, the facility has a 27-mile Pueblo River Trails System. Grounds are open from 7a.m. to 10 p.m. daily. There is a $3 parking fee at the center on the river. If you’re expecting a Riverwalk like San Antonio or Louisville, Kentucky, forget about it. What you get is a 15-minute ride on a boat around a manmade lake. You purchase tickets at the Riverwalk Visitor Center. Your Passport ticket provides for one free ride which is another savings. Otherwise, it’s $5 for adults and $4 for seniors. Boats run regularly every 45 minutes. Rides are narrated, and you learn about the outdoor amphitheater, Gateway Plaza, Pike Center which is dedicated to Zebulon Pike, and the small Kelly Falls. They do have special events here such as an outdoor church meeting was happening. You pass under several bridges including one dedicated to all five military services. You also pass a few sculptures including two pieces of metal from New York’s World Trade Center. HARP revitalized a segment of downtown that was unsightly and unusable. However, the boat ride is not one of the city’s strengths. I recommend saving your time and money for another attraction. On June 3, 1921, Pueblo had a massive flood. They lost 250 lives, 510 homes, 98 businesses, and 61 stores. Since Pueblo was a large rail center for the Colorado Fuel and Iron Co., Colorado’s largest employer, they lost 46 locomotives, 1,274 railcars, and miles of track. This led to the building of a levee soon afterwards. In 1978, a group of Colorado State University of Pueblo students, in the dead of night, painted a giant cod on the levee. They set up lookouts to watch for police and by rope lowered themselves over the levee’s walls. Overnight, the levee became home to a public art project. It now has individual paintings on a wide variety of subjects and styles. It’s estimated more than 1,000 painters have constructed the mural. The project is a 3-mile long piece of artwork. It holds the Guinness Book of World Records as the world’s largest continuous painting. It’s difficult to see by auto. We saw only short pieces of it in two spots. But you can take the walking or biking path along the levee to view it. Tomorrow we head for another ride on the Royal Gorge Train - concentrating on photography instead of notes. Then it’s back to Pueblo’s museums. We hope you have a good week and I’ll be back in touch this weekend.